KENTON — Two farmers in Hardin County showed their prize cows at the Hardin County Fair, taking awards for grand champions for the male and female beef stock. 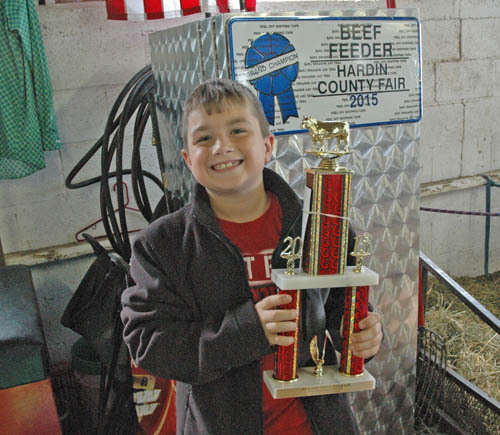 Garret Hensel, 9, of Hardin Northern, won the male grand championship beef feeder sired from the “Italian Stallion” as his father Aaron explained, producing registration papers outlining a prized cow’s genealogy. Dad surmises the frisky calf’s winning features may have included his fluffy hair and broad flanks. In the stall next to Hensel was the female prize winning beef feeder owned by Derek Dunson of Dunson farms. Coincidentally the two prize winning cattle were brother and sister. Dunson’s cattle have been the product of modern breeding techniques and quality stock. In modern day farming according to the Dunsons, using frozen embryos of superior stock, and recipient cows for calving results in quicker results and premium livestock. His father Rick Dunson said they had gotten started when his kids wanted to do a project with cows for 4-H.
“There was room in the barn, and after a few years we were up to 20 cows,” Dunson said. The cattle they produce are then sold off, usually for breeding purposes.